If you want to have fun with fabrics, deviating from the �rules� but still keep the elements of good design in check, you will have fun playing with Dianne�s quilt games. Dianne uses wonderfully bright fabrics in her �Quilters Playtime� by showing you a different way to play the traditional children�s games of Hopscotch, Tic-Tac-Toe, Pin The Tail On The Donkey, Musical Chairs, Pick-Up-Sticks, Tiddly Winks, Ring Around The Rosy, to have loads of quilting fun. Just recently I was privileged to be in one of Dianne�s classes, and also observe her Quilters Playtime class at a Sunshine State Quilt Association Symposium at Daytona Beach, Florida. Her class participants were having so much fun and making great class projects. As Dianne tells us �the purpose of Playtime is to free your creativity via liberating games at the sewing machine and on your design wall.� With her book and in her class her students do just that. They have fun, freeing up some preconceived notions about what quilting is about. Even if you are a traditional quilter, I suggest you read her book, follow her �lessons�, and broaden your experiences in Quiltmaking. It will even help you in your traditional quilt design, making you stretch your ideas and make your quilts more exciting. The instructions are so well organized, even as far as dividing the chapters for each quilt game into sections, �Object of the Game,� �Game Plan,� �Your Move,� and �Winning,� that they are fun and very, very helpful to completing your project. 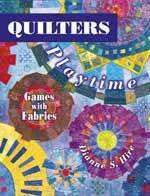 This is a fantastic book and as Dianne says, �play your hunches, be impulsive, and find the fun.� Quilters Playtime is well worth the money and your time. Buy it for your personal and your guild library. Look for this book at your favorite quilt shop!